Ideal for automation-assisted small parts production, the compact 2SP-H Series horizontal lathes take up very little floor space while making a big impact on your productivity. 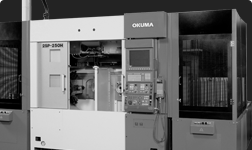 Okuma moved the innovative front facing spindle to one side so you can incorporate the optional Okuma Gantry Loader (OGL) into your production line. This enables the system to automatically load and unload parts, thus saving operator time and reducing cost-per-part. Options include dual spindles to further reduce cycle times, and Okuma’s exclusive Thermo Friendly Concept to maintain accuracy. Quick and compact horizontal lathe. Compact and automation-friendly horizontal lathe.